An entrance hallway leads to the open plan lounge/dining/kitchen. The lounge opens out through fully opening stainless steel patio doors onto the private patio area, with its stainless steel balustrade with tinted glass panelling. The lounge area has a fully equipped surround sound HiFi & television system. All furnishings are contemporary and designed to ensure maximum comfort and usability. The Master Bedroom opens out through fully opening stainless steel patio doors onto its own private patio area. There is a Master En-suite bathroom with Showerlux platinum finish sliding shower doors, electric shower and Roca toilet and washbasin. 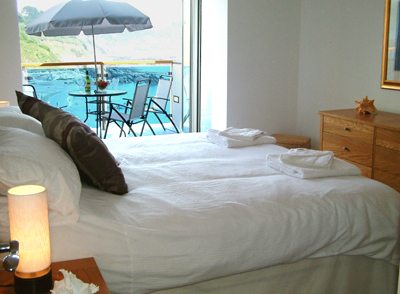 Millendreath’s Master bedroom is the ultimate in luxury and comfort - peaceful and restful, just what you need after a long day sunbathing or an evening of fine dining in the old town of Looe. 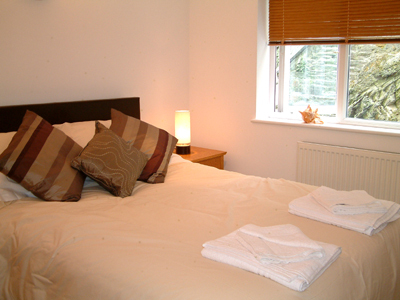 The second bedroom at Millendreath is also en-suite with a Heritage shower/bath and powerful electric shower. Roca wash basin and matching toilet, contemporary polished chrome single lever taps and fittings, a polished chrome ladder style heated towel rail and combined vanity mirror and shaver point. 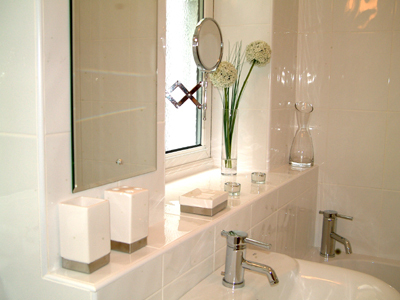 The tiling is bumpy white high gloss on the walls and beige porcelain tiles on the floor. Millendreath is finished throughout to the highest standard. Attractive single panel white oak veneer doors with Padouk inlay are complemented with Italian designed, smooth polished chrome ‘wave style’ door levers and the living area is finished with matching lacquered oak floor boarding. Lighting can be adjusted to match your mood with half oval flush mounted wall up-lighters and polished steel lighting tracks to the kitchen and bedroom areas. 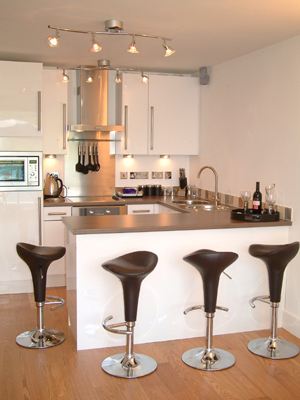 All light switches and wall sockets are high quality polished stainless steel. Millendreath is warm and comfortable any time of the year as it has a fully controllable gas central heating system – ideal for a winter’s break. 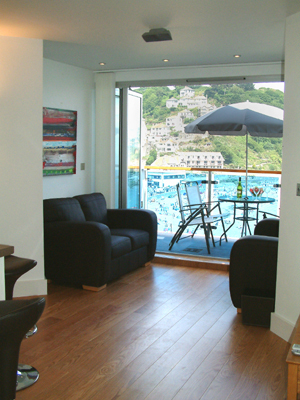 With the mild climate that Cornwall enjoys, for large parts of the year you can of course sit out on your patio enjoying a glass of fine wine and the splendid views. Entry to Millendreath is secure with a punch code door entry system with intercom at the front entrance. A car parking space is allocated in Westcliff car park to the rear of the building. Millendreath is truly a masterpiece of contemporary design and a luxurious option for a family or friends seeking the perfect blend of service and freedom for which our apartments are renowned.